Principal Planner Lindsay Smith Puckett Named Top 40 Under 40! Why was the U.S. 280 Corridor Transit Study performed and what is the relationship between the study recommendations and ALDOT’s proposed elevated roadway intersection improvement project? What local jurisdictions are included in the U.S. 280 Corridor Transit Study? What was the purpose of the U.S. 280 Corridor Transit Study? Why was the U.S. 280 Corridor Transit Study performed and what is the relationship between the study recommendations and ALDOT’s proposed intersection improvement project? 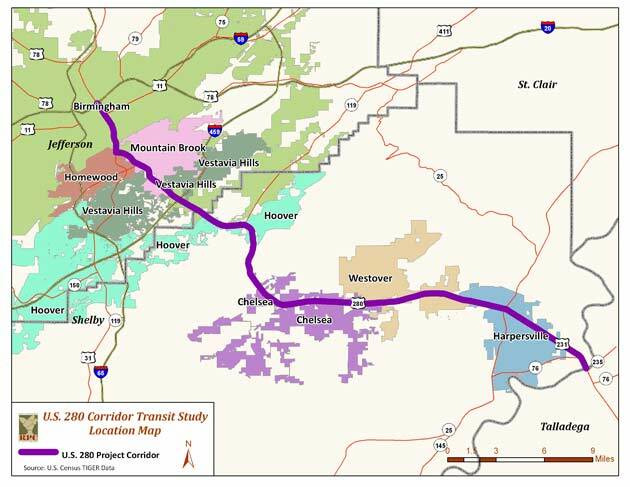 This corridor was studied as a result of the Birmingham Regional Transportation Alternatives Analysis completed in 2004, which recommended that a detailed analysis of the U.S. 280 Corridor be performed to identify feasible transit options. This study was funded through a grant from the Federal Transit Administration (FTA) and it is a completely separate effort from any Alabama Department of Transportation’s (ALDOT) roadway improvement plans. ALDOT’s recently proposed intersection modifications should be considered short term improvements and will not conflict with the recommendation of this study which is to include a premium transit service in the corridor as part of a long term solution. What local jurisdictions were included in the U.S. 280 Corridor Transit Study? The U.S. 280 Corridor has developed rapidly over the past 20 years, and in some places, it is the most congested roadway in the entire Birmingham metropolitan planning area. The study examined a range of public transportation alternatives to improve travel along U.S. 280. The study also provided an opportunity for local planners and decision-makers to work together on land development and redevelopment strategies to preserve the unique character of their communities, while improving transportation operations along U.S. 280.